Besides proposing an amnesty to fight drug violence, Lopez Obrador revived his famous 2006 campaign slogan, "For the good of all, the poor come first." 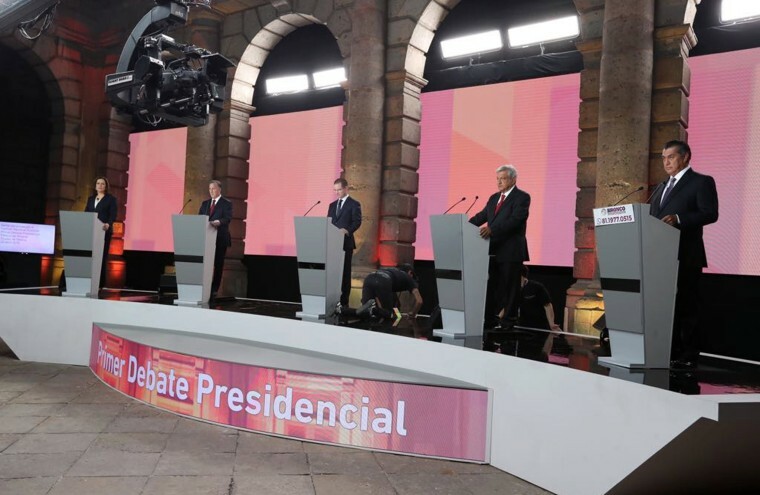 MEXICO CITY — The first of Mexico's presidential debates opened Sunday night with rivals concentrating their fire on front-runner Andres Manuel Lopez Obrador, who defended the idea of an amnesty to fight drug violence and revived his famous campaign slogan from 2006, "For the good of all, the poor come first." The leftist candidate defended his proposals to "speak with everybody" to solve Mexico's crime problem. He said he would even invite the pope to discuss how to carry out such a dialogue. The other candidates harshly criticized the amnesty proposal. Third-place candidate Jose Antonio Meade said the proposal put Lopez Obrador "on the side of the criminals." But all of the candidates conceded that Mexico's anti-crime and law enforcement policies have been a failure. Even Meade, who is running for the governing Institutional Revolutionary Party, the PRI, and who served in several Cabinet posts in the current administration, acknowledged the weakness of police. "Above all, we don't investigate," he said. Since his failed presidential bids in 2006 and 2012, Lopez Obrador has sought to move to the middle and hadn't much mentioned the "poor come first" slogan of the 2006 campaign until Sunday. He later hedged it a bit, saying that if he is elected, his government "would represent the rich and the poor." In 2006, Lopez Obrador also held a significant lead early in the race, and conservative sectors sought to link him to another leftist — then President Hugo Chavez of Venezuela, whose socialist policies are blamed by many for the economic implosion that is wracking that country. Ricardo Anaya, the former head of the conservative National Action Party, again sought to play the Venezuela card Sunday, saying Lopez Obrador's proposal to hold recall votes was similar to tactics used by Venezuela's ruling socialists to hold on to power. Known in the past for his extremely slow and often rambling speech, Lopez Obrador on Sunday was focused and appeared better prepared. He had little problem distinguishing himself from the other four candidates, because they all often turned to attack him. Lopez Obrador has held a lead of as much as 20 points in some opinion polls on the July 1 elections. "This isn't just another election," Lopez Obrador said. "This is to truly change things in this country." Lopez Obrador became overconfident in 2006, skipped a debate and eventually lost by a tiny margin, and that the danger appeared to hover over him Sunday. At one point he said: "Here is the latest poll and, not to brag, but with all humility, 48 percent. Something terrible would have to happen" for him not to win. Foreign policy was absent from the first debate, though it will be on the agenda for debates in May and June, but independent candidate and former first lady Margarita Zavala still got in a swipe at U.S. President Donald Trump. "The focus of my government will be to defend Mexicans, to defend you, from the corrupt ones, from the criminals, defend you from Trump," Zavala said. The debate was also marked by a couple of bizarre proposals. Independent candidate Jaime Rodriguez, the swaggering governor of the northern state of Nuevo Leon, proposed cutting off the hands of politicians who steal public funds. And, he said, "Mexico would be great ... if the president answered WhatsApp messages."